The Starter Motor Heat Shield is designed with heat resistant material sandwiched between two aluminum plates. 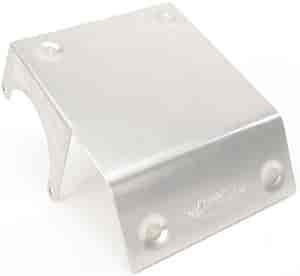 The shield protects the starter from heat buildup from the exhaust system, especially important when using headers. Fits Chevy small & big block and V6. Does Mr Gasket 3678 fit your vehicle? 3678 is rated 3.3 out of 5 by 3. Rated 5 out of 5 by Sec58 from PRODUCT WAS AS PICTURED PART FIT AS ADVERTISED WITH NO MODS NEEDED HIGH QUALITY PART. Rated 4 out of 5 by Johnny and Jules from Needs room to fit This looks like a sturdy, well designed product, but we weren't able to use it. There just wasn't enough room between the extra long header and the starter motor on our 305 small block. We had to go with a flexible mylar wrap.